ROMETA will be in BAUMA MUNICH 2019, the world's leading construction machinery trade fair, from the 9th to the 12th of April. You can meet us in Hall A1 booth 220. 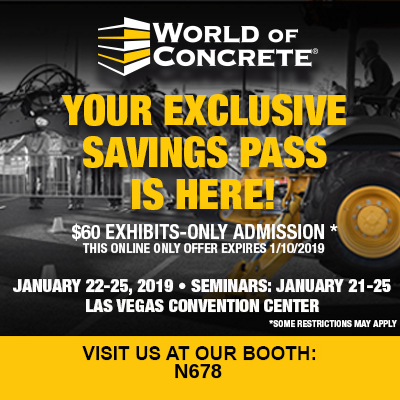 We will attend trade show WORLD OF CONCRETE 2019 in Las Vegas (USA). We will be very pleased to meet you in Convention Center from January 22rd to 25th. We will attend trade show BETON IZMIR 2018 in Gaziemir (Turkey). We will be very pleased to meet you in Beton Izmir from April 25th to April 28th in booth 302.